11 A None No Power Seat 11 A is a standard Economy Class seat that may have slightly restricted legroom due to the position of the bulkhead. There is no floor storage during take-off and landing. 11 B None No Power Seat 11 B is a standard Economy Class seat that may have slightly restricted legroom due to the position of the bulkhead. There is no floor storage during take-off and landing. 11 C None No Power Seat 11 C is a standard Economy Class seat that may have slightly restricted legroom due to the position of the bulkhead. There is no floor storage during take-off and landing. 11 D None No Power Seat 11 D is a standard Economy Class seat that may have slightly restricted legroom due to the position of the bulkhead. There is no floor storage during take-off and landing. 11 E None No Power Seat 11 E is a standard Economy Class seat that may have slightly restricted legroom due to the position of the bulkhead. There is no floor storage during take-off and landing. 11 F None No Power Seat 11 F is a standard Economy Class seat that may have slightly restricted legroom due to the position of the bulkhead. There is no floor storage during take-off and landing. 11 G None No Power Seat 11 G is a standard Economy Class seat that may have slightly restricted legroom due to the position of the bulkhead. There is no floor storage during take-off and landing. 11 H None No Power Seat 11 H is a standard Economy Class seat that may have slightly restricted legroom due to the position of the bulkhead. There is no floor storage during take-off and landing. 11 J None No Power Seat 11 J is a standard Economy Class seat that may have slightly restricted legroom due to the position of the bulkhead. There is no floor storage during take-off and landing. 25 A None No Power Seat 25 A is a standard Economy Class seat that has extra legroom due to the exit however, the proximity to the lavatories may be bothersome. There is no floor storage for this seat during take-off and landing. 25 B None No Power Seat 25 B is a standard Economy Class seat that has extra legroom due to the exit however, the proximity to the lavatories may be bothersome. There is no floor storage for this seat during take-off and landing. 25 C None No Power Seat 25 C is a standard Economy Class seat that has extra legroom due to the exit however, the proximity to the lavatories may be bothersome. There is no floor storage for this seat during take-off and landing. 25 D None No Power Seat 25 D is a standard Economy Class seat that has extra legroom due to the exit however, the proximity to the lavatories may be bothersome. There is no floor storage for this seat during take-off and landing. 25 E None No Power Seat 25 E is a standard Economy Class seat that has extra legroom due to the exit however, the proximity to the lavatories may be bothersome. There is no floor storage for this seat during take-off and landing. 25 F None No Power Seat 25 F is a standard Economy Class seat that has extra legroom due to the exit however, the proximity to the lavatories may be bothersome. There is no floor storage for this seat during take-off and landing. 25 G None No Power Seat 25 G is a standard Economy Class seat that has extra legroom due to the exit however, the proximity to the lavatories may be bothersome. There is no floor storage for this seat during take-off and landing. 25 H None No Power Seat 25 H is a standard Economy Class seat that has extra legroom due to the exit however, the proximity to the lavatories may be bothersome. There is no floor storage for this seat during take-off and landing. 25 J None No Power Seat 25 J is a standard Economy Class seat that has extra legroom due to the exit however, the proximity to the lavatories may be bothersome. There is no floor storage for this seat during take-off and landing. 3 F None No Power Seat 3 F is a standard Business Class seat however, the proximity to the lavatories and galleys may be bothersome. 3 J None No Power Seat 3 J is a standard Business Class seat however, the proximity to the lavatories and galleys may be bothersome. 34 A None No Power Seat 34 A is a standard Economy Class seat in the last row of the aircraft that may have slightly limited recline. The proximity to the lavatories and galley may be bothersome. 34 B None No Power Seat 34 B is a standard Economy Class seat in the last row of the aircraft that may have slightly limited recline. The proximity to the lavatories and galley may be bothersome. 34 C None No Power Seat 34 C is a standard Economy Class seat in the last row of the aircraft that may have slightly limited recline. The proximity to the lavatories and galley may be bothersome. 34 G None No Power Seat 34 G is a standard Economy Class seat in the last row of the aircraft that may have slightly limited recline. The proximity to the lavatories and galley may be bothersome. 34 H None No Power Seat 34 H is a standard Economy Class seat in the last row of the aircraft that may have slightly limited recline. The proximity to the lavatories and galley may be bothersome. 34 J None No Power Seat 34 J is a standard Economy Class seat in the last row of the aircraft that may have slightly limited recline. The proximity to the lavatories and galley may be bothersome. 35 D None No Power Seat 35 D is a standard Economy Class seat however, the proximity to the lavatories and galley may be bothersome. 35 F None No Power Seat 35 F is a standard Economy Class seat however, the proximity to the lavatories and galley may be bothersome. 36 D None No Power Seat 36 D is a standard Economy Class seat in the last row of the aircraft that may have slightly limited recline. The proximity to the lavatories and galley may be bothersome. 36 E None No Power Seat 36 E is a standard Economy Class seat in the last row of the aircraft that may have slightly limited recline. The proximity to the lavatories and galley may be bothersome. 36 F None No Power Seat 36 F is a standard Economy Class seat in the last row of the aircraft that may have slightly limited recline. The proximity to the lavatories and galley may be bothersome. 4 A None No Power Seat 4 A is a standard Business Class seat however, the proximity to the lavatories and galleys may be bothersome. 4 C None No Power Seat 4 C is a standard Business Class seat however, the proximity to the lavatories and galleys may be bothersome. 4 D None No Power Seat 4 D is a standard Business Class seat however, the proximity to the lavatories and galleys may be bothersome. 4 F None No Power Seat 4 F is a standard Business Class seat however, the proximity to the lavatories and galleys may be bothersome. 4 G None No Power Seat 4 G is a standard Business Class seat however, the proximity to the lavatories and galleys may be bothersome. 4 J None No Power Seat 4 J is a standard Business Class seat however, the proximity to the lavatories and galleys may be bothersome. Audio Video on Demand (AVOD) is available at every Premier World and Economy Class seat. 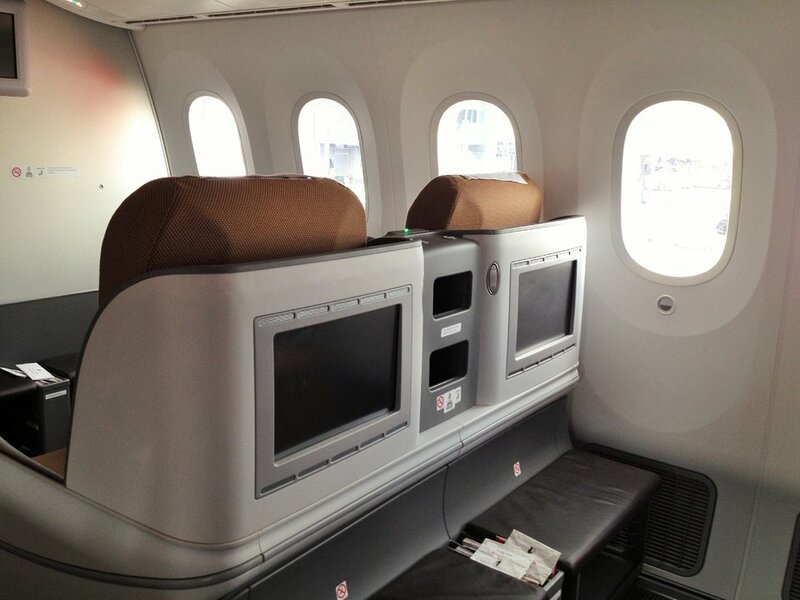 Personal televisions with Audio Video on Demand (AVOD) is available at every Premier World and Economy Class seat. There are 110v AC power ports at all Premier World and Economy Class seats. Kenya Airways operates their Boeing 787-8 on medium to long-haul flights. This aircraft flies in a two class configuration with 30 flat bed Business Class seats and 204 standard Economy Class seats. 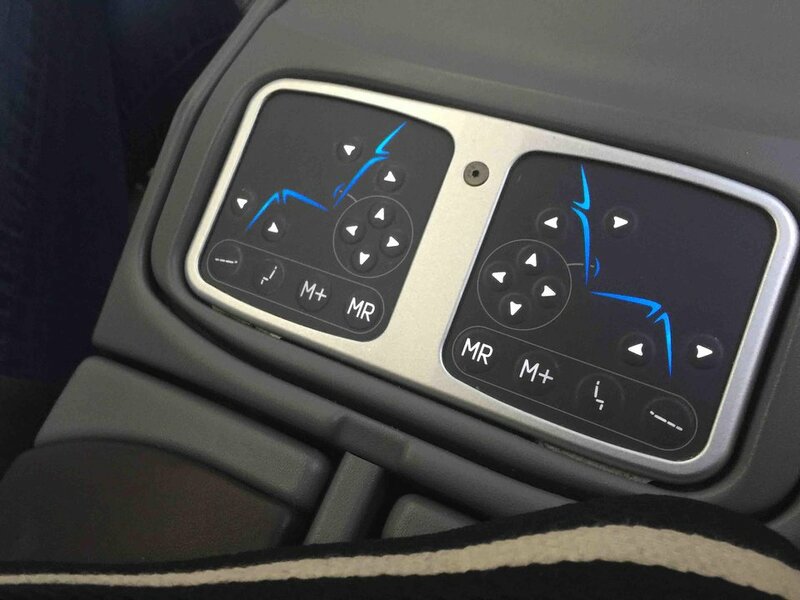 This business seat is nice automatic system easy to use, nice confort ... I flow 9 hours betwin Amsterdan & Nairobi! I slep well full flat bed !!! There is no window in this row! AVOID AVOID AVOID. I picked this seat because of it's close proximity to the toilets - being an 8.5hr flight! Sitting my the toilets doesn't bother me in the slighest but this seat - this plane - so awful. So little room. The bad things you hear and read about the Dreamliner 787-8 are all true and this is coming from someone who knows nothing about planes and is quite happy to plonk down in any old seat and enjoy the journey (I've flown Canada and various places in Europe). The legroom is non existent (and I'm only 5'6") and the space between you and the back of the seat in front is scarily small. I was unfortunate enough to have a very selfish travelling in front of me on the way out who reclined his chair fully for almost the entire journey and let me tell you, a claustrophobic person would have been in trouble in such a scenario. The gap between my face and the back of the seat in front was no more than 7" - for 8hrs! I felt completely boxed in and somewhat trapped, to be honest. I think only a small child could cope in these seats. The seat design itself is really not comfortable, pushing out the lower back, forcing one into a slightly curved position which I didn't find comfortable at all. I'd go as far as to say I'd pick another airline if this plane came up on my next route. Seats 1D and 1F do not have overhead storage space. The pilot bunks are located in the crawl space directly above these seats and the stairs are on the other side of the bulkhead divider. Plane 5Y-KZA thru 5Y-KZG all need maintenance even though they are fairly new at about 3 years old (I've flown on planes A, B, C and G). The lavatory toilet seats cannot stay up and is tricky for men to relieve themselves. I absolutely hate this plane.it is certainly more cramped than the old fleet. Plus theres less rows. On Old fleet plane i always had row 31. 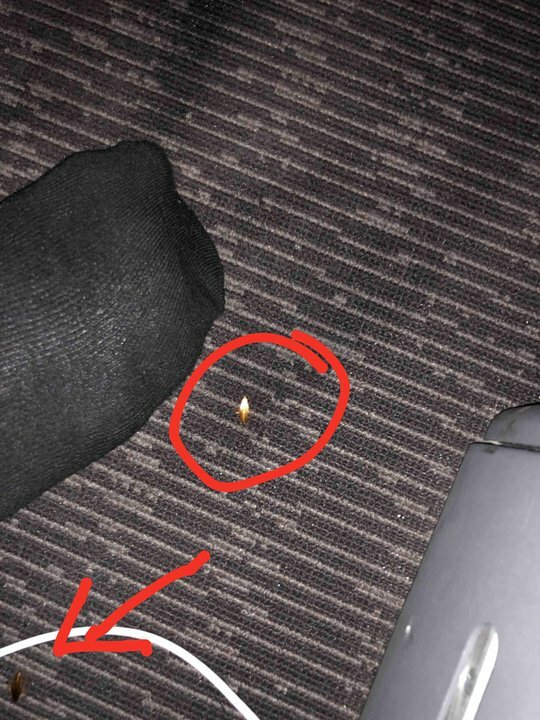 As there was just 2 seats together. Perfect when you were a couple. I have been flying with kq for years,but i am considering changing airlines. Also the flight from nairobi to heathrow has changed to a daytime flight with terrible connections from mombasa to nairobi. I had the misfortune to be placed at le last minute on this aircraft, as KLM messed up my original flights to Kilimanjaro. There is absolutely no way the seats are 18.5 inches wide, as claimed. I'm just an average sized male, we were three in my row, and eating could only be performed with one's elbows in front of our bodies. The seats were even narrower than the ones on Air France's B777 with 10 across seating that I had used to get to Paris from Canada. What good are bigger windows and fancy electronic blinds when there is no basic comfort like seats build for average humans? Extremely uncomfortable seats for such a new plane. Hard, and less knee room than an A330, B767 or other comparable wide-bodies. Kenya shouldn't have given up their 777 fleet. The guy on seat 14D was taking half of my seat and the guy behind on seat 15F had his feet right under my feet. 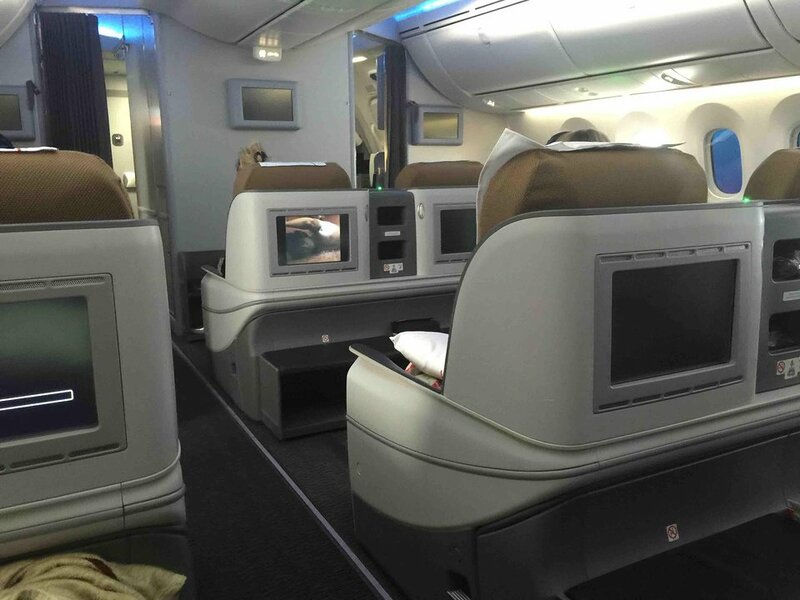 Seats are too small or even smaller than the Boeing 777. I am short at 5.2ft and felt very uncomfortable.Couldn't sleep.Last time in 2013 and 2014 I travelled on the Boeing 777 the last 2 seats at the back had enough leg room.Very comfortable. I hated this plane. I had three seats to myself with about six feet of legroom in front of me and I still felt cramped. The seats are too narrow. Bring back the 777. I found the seats very close together and I'm a very short person. My next seat neighbour seemed to be sitting on my half of my seat most of the night. I don't know why there is so much hype about this aircraft if this is normal. This seat is right next to the curtain dividing Business from Economy sections, which was irritating at times. Overhead luggage compartment is in use as storage by flight attendants and may already contain items. 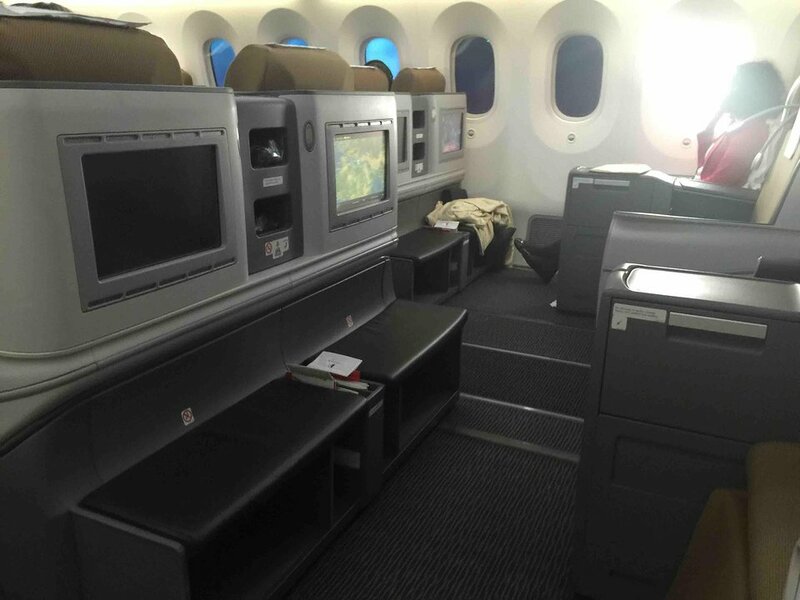 Kenya Airways flies 1 versions of Boeing 787-8.